Bang! 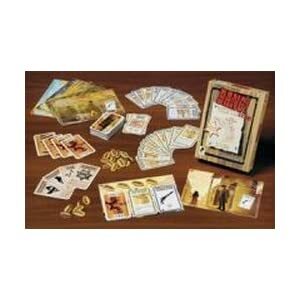 is a very simple, yet funny card game ideal for slightly larger gaming groups. If seven people have turned up for a six-player game, Bang! can save the day. Some of the expansions improve the game a lot, but the basic game is still a lot of fun. Sheriff: I’ll kill all these outlaws and restore peace! Outlaws: Let’s kill the sheriff who is in our way! Deputy Sheriff: Oh no! I can’t let the outlaws harm my boss! Renegade: Ah haa! Here’s my best opportunity to eliminate everyone and become the new sheriff! Well this is the game in a nutshell. This game is truly multi-player in nature in that it can accommodate four-seven players. This game is a fighting, bluffing, little bit of mystery, classic western, role-playing (some of my RPG friends may take offence to this being called a Role Playing Game, but it is in a very simple sense though)! The goal of the game is to either survive to the end, or to outlive a class of players, depending on your role. You can try to figure out who is who based on their actions in each round. Killing your allies is not recommended, but it happens all the time. There are four different characters in Bang! A Sheriff, who is the only player who reveals his identity; outlaws; deputies; and a renegade. It’s the job of the Sheriff to survive until the end; if that player stays alive, the good guys (Sheriff and deputy players) win. The renegade must outlive everybody else, but still kill the Sheriff, to win. The outlaw players win if the Sheriff dies before the end of the game. A player’s turn begins with drawing two cards, then playing as many cards from their hand as possible. Item cards are placed face-up in front of the player, and can have an immediate effect or a delayed effect. Some items help protect the player from Bang! cards, while others grant longer range or other special abilities. Only one Bang! card may be played during each turn, but this doesn’t mean you can’t pick on an opponent, as many other cards have the same impact as Bang! cards. Playing a Bang! card means your opponent must play a Miss card. If they cannot, and have no items to save them from the bullet, they lose one life point. Falling to zero life means they are eliminated from the game. Drinking alcohol can increase your life points. Beer is the basic life point, while stronger liquor adds more points. Players may only attack enemies within reach. The default range is one, meaning you can only Bang! at players seated immediately to your left or right; weapons increase the range you can shoot up to a maximum of four. A horse or mule will increase the effective range you are away from somebody, but not alter the distance you can shoot, so it’s a good idea to find a mount as soon as possible. Other cards, like dynamite and jail, increase the tension (and the fun) by limiting a player’s turns, or blowing them up for three hit points of damage. The dynamite is great fun, because if one player avoids the explosion, the dynamite is passed clockwise for the next player to deal with! The public identity of the Sheriff means it’s easy to see who the outlaws are, as they swarm to attack the poor lawman, but everybody else being in the dark about their friends and foes lends the gameplay a nice twist. Many more fun options exist. There is never a dull moment in the game and it is high voltage action all along. But for the Sheriff none of the other players reveal their roles, so it is going to be a game of cat and mouse trying to guess who is on whose side! If the sheriff and his deputy kill all the outlaws and Renegade they win. If the outlaws kill the sheriff they win! If the Renegade manages to be the only one alive- he wins (this btw is the most difficult role and fun role to play). You don’t know who’s on whose side, but you keep guessing and shooting at people. There is going to be chaos, pandemonium and lots and lots of laughter. There is limited amount of strategy, but this game was not supposed to be a strategy brain burner, but just a game of unadulterated fun and laughter for the family and friends alike. I’ve seen people seeking revenge the next time around when they play completely disregarding the roles! Absolutely hilarious this one I say! I have heard stories where people have almost got into fistfights! Each game lasts somewhere between 30-40 mins. So there you go, such a small duration and so much fun. Just that it might take a little longer in the initial games till you get used to the different cards, but once you are through, the fun really kicks in. The cards are well illustrated and hard-wearing. The many available expansions help to keep the game fresh and interesting for multiple replays. Bang! is a great game. It’s fast, easy to understand, loaded with potential to start real-life blood feuds, and will have western movie fans drooling to play. Fun in its purest sense, chaos, pandemonium, laughter etc., I can keep going on with adjectives. But in a nutshell this is Bang! To keep it simple, straight and plain, my final verdict: You cannot not have MY copy… period!! Go and get it everyone; Immediately! 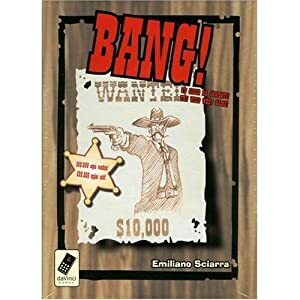 If you’ve played the Bang! game, then please rate it or leave your own thoughts by clicking the Comments link below.